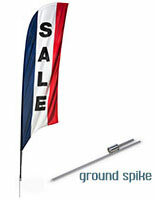 Are you looking for message flags & banners to attract new and repeat customers to your business? 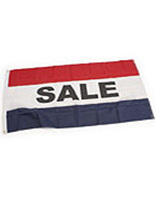 We carry a long line of pre-printed advertising options for all your display needs! 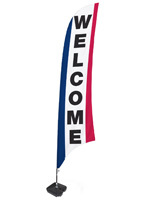 These assorted signs come with several messages like “Open”, “Welcome”, and “Sale”! 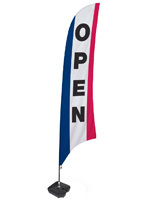 These message flags & banners come with several options for bases therefore creating a stable and durable outdoor fixture. 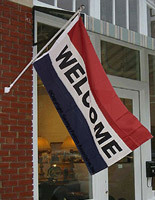 These outdoor displays are designed to be seen by those driving or walking by in either direction. 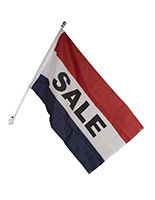 The message flags & banners, also known as assorted signs, are perfect for sidewalks, hanging outside doors or placing in parking lots. What types of pre-printed messages are on these assorted signs? 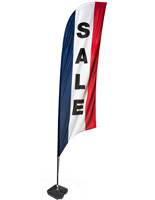 These message flags & banners come in several colors and styles to best fit your business needs. 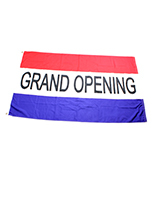 Choose from “Sale”, “Grand Opening”, “Open”, “Welcome” for outside in parking lots or by entrances. 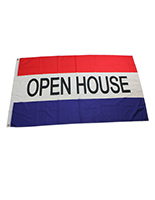 The “Leasing”, “Open House” and “Now Renting” signs are ideal for real estate companies or even for outside of specific homes, office spaces or apartment buildings. 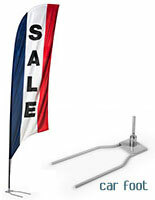 The “Pizza” advertising display is perfect for restaurants, pizza parlors and cafes. 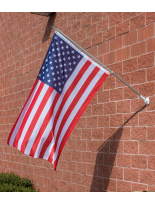 We also carry a plain red, white and blue banner with no lettering or signs that are red and yellow for even greater eye-catching capabilities. 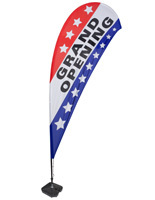 Aside from the various pennants and pre-printed options, all of the displays come with various bases for outdoor use. 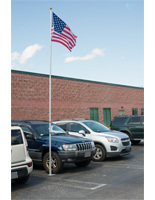 We have cross bases, ground spikes, car foots and water bases depending on the needs of your business or location. 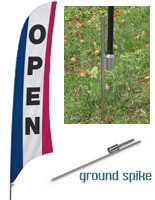 The ground spikes are perfect for securing in grass or dirt. 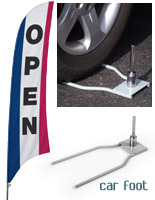 The car foots easily slide underneath tires for car dealerships. 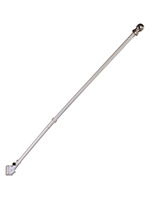 The water base adds weight to windy areas or areas where inclement weather is often expected. 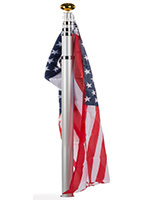 The cross base is more simple and perfect for indoor use as it takes up little to no floor space. The inexpensive and attention grabbing signs are a great alternative to neon signage. 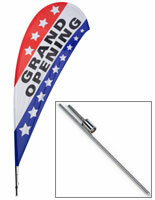 The banner flags don’t use any electricity and can be placed anywhere without having to plug in or inflate. 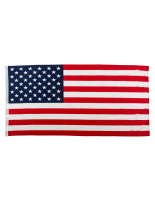 Order at wholesale prices today and receive ultra-fast shipping on your order from StoreFixture.com!